The theatre industry as a whole doesn’t take safety as seriously as other industries. Construction sites, for example, have very strict rules covering every facet of their work – and with good reason given the nature of the work. As theatre practitioners, there’s a lot we can learn and a lot we can collectively do better. In construction, the top 4 most fatal hazards are falls, being struck by an object, being crushed under objects, and electrocution. Common hazards in theatre are remarkably similar, especially during load in, load out, and set construction. When injuries happen during a show it becomes headline news, as with the multiple accidents that occurred during the now infamous run of Spiderman on Broadway. But accidents at other times can go unnoticed. Recent data is hard to find, but injuries resulting in time off peaked at over 1,500 in 2007. In London, in 2014, a stage manager walked through an unmarked backstage door and fell ten feet onto the stage. The door, which had previously led to a balcony, had never been properly secured. In another incident in 2008, a drama student was killed when he was crushed under particle board, even though he was wearing safety gear. Several years ago, a series of stage collapses and other major event-related disasters prompted the creation of the Event Safety Alliance – an organization making incredible progress in event safety. Understanding risks is one way to keep “break a leg” from becoming literal (the most common injuries for theatre types are, in fact, to the “lower extremities”). OSHA has rules in place that govern everything from fall protection to PPE to operation of equipment. But there are different standards for different types of workbeing done. The 4 major categories of standards are Construction, Maritime, Agriculture, and General Industry (which is a bit of catch-all for everything else). Theatre falls under “General Industry Standards”. There are arguments that much of what we do should fall under the standards for “Construction” or we need our own set of standards in the entertainment industry. Regardless of which we ultimately settle upon, we need safety rules. Many theaters put parts of these standards into practice, but without regulations, we’re left up to the discretion of each organization. This has led to vast differences in safety practices from one institution to another with little consistency achieved. Noise Protection should be provided when the noise exceeds 115 decibels for a short period or 90 for a full 8 hours, on a sliding scale. Some power tools can easily exceed these levels. Wearing ear protection should be routine for anyone operating drills, etc, while building a set. Hard Hats should always be worn when there is any chance of head injury from impact or falling or flying objects (Read: wear hard hats while constructing stages or if people are working above). Safety Glasses should be worn any time there is a chance of flying particles. Ventilation equipment may be needed when working around chemicals or particulates (painting, wood-working, etc). Lifelines and harnesses should be used at all times, and only used on people (that may sound obvious, but fall protection gear is often damaged by using it to haul objects). Guard rails and signs should be used in any backstage areas where a fall hazard is possible. Doors to nowhere should be locked and secured. Use a temporary guardrail along the edge of the stage during set construction. It’s also worth taking a look at standards for scaffolding, electrical equipment maintenance, and loading docks (yes, people fall off of loading docks all the time). Regardless of what standards we use, there are many safety procedures we should put in place that are proven to help reduce the risk of injury. Just because it isn’t required, doesn’t mean we shouldn’t do it anyway! Applying a higher level of safety and safety education can prevent accidents and help make sure the show goes on (and that we go on!). Many injuries come from a lack of appreciation for how dangerous our industry is and what the potential hazards are. 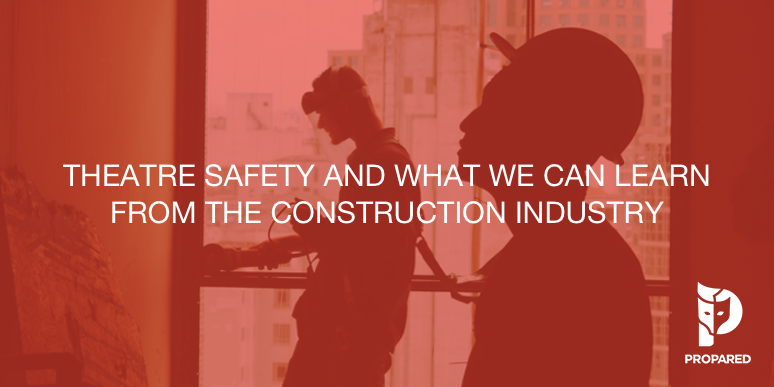 We’ve written before about the importance of creating a culture of safety in your organization and other topics – and we will continue to do so. Our health, safety, and well-are such important topics for us all.